A three-dimensional (3D) chemical characterization of nanomaterials can be obtained using tomography based on high angle annular dark field (HAADF) scanning transmission electron microscopy (STEM) or energy dispersive X-ray spectroscopy (EDS) STEM. These two complementary techniques have both advantages and disadvantages. The Z-contrast images have good image quality but lack robustness in the compositional analysis, while the elemental maps give more element-specific information, but at a low signal-to-noise ratio and a longer exposure time. Our aim is to combine these two types of complementary information in one single tomographic reconstruction process. 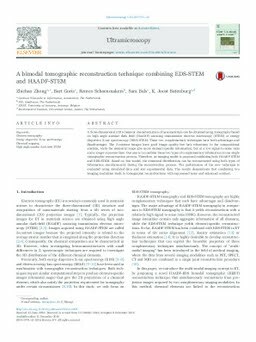 Therefore, an imaging model is proposed combining both HAADF-STEM and EDS-STEM. Based on this model, the elemental distributions can be reconstructed using both types of information simultaneously during the reconstruction process. The performance of the new technique is evaluated using simulated data and real experimental data. The results demonstrate that combining two imaging modalities leads to tomographic reconstructions with suppressed noise and enhanced contrast.